Hello again, this is You ‘Tsuru’ Nakatsuru from Analysis Center. It has been just about two years since I delivered a talk “Fight Against Citadel in Japan” at CODE BLUE 2013 (an international security conference in Tokyo) about the situation on banking trojans observed in Japan at that time and detailed analysis results on Citadel (See my blog entry here). For the presentation material and audio archive, please see Reference . Since then, various kinds of efforts have been implemented against this malware. Citadel was less and less seen among incident reports to JPCERT/CC, and there had been no reports about it since the first half of 2014. However, in late November 2015, we observed an attempt to infect a host with an upgraded Citadel via Drive-by-Download attack. In this blog article, I will discuss how this upgraded Citadel (here after tentatively named as “Citadel 101” since the version was set as 0.0.1.1) had changed from Citadel version 1.3.5.1 (hereafter “Citadel 1.3.5.1”) which I presented at CODE BLUE. I will also introduce a decryption tool for Citadel 101 created by JPCERT/CC. It is widely known that Citadel 1.3.5.1 has a function which is not related to its intended behaviour: When executing with argument “-z”, the following message is displayed. Figure 1: Dialog box displayed when executing with argument "-z"
This is a message impersonating Brian Krebs, a well-known security researcher of Krebs on Security. He himself actually has written an article about this (See Reference ). In Citadel 101, this function has been removed. There have been some slight changes in structures used within Citadel. For instance, in BinStrage (used as data format for configuration files), the size of random data at the beginning of the header had been changed from 20 bytes to 32 bytes as in Figure 2. As I introduced at CODE BLUE, Citadel 1.3.5.1 encrypts files, registries and communication data, as indicated in Table 1. Citadel 101 encrypts the same objects and uses the same encryption methods as Citadel 1.3.5.1, however, XOR operation has been added at the beginning of the encryption process and the end of the decryption process. Data retrieved through the same decryption method as Citadel 1.3.5.1 includes XOR key (key2) and encoded data (data), which are used in the XOR decoding process (shown in Figure 3). 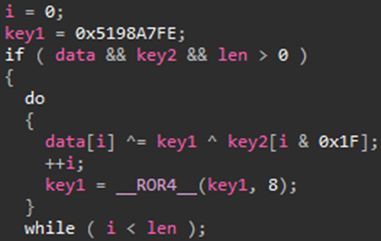 The default value of key1, which is one of the XOR keys used here, is hardcoded in Citadel itself. In the incident handling process, this value has to be newly retrieved in order to decrypt data encrypted by Citadel. Citadel Decryptor is a tool to decrypt data encrypted by Citadel, which I created and presented at CODE BLUE. This time, I expanded its feature so that it can decrypt data encrypted by Citadel 101 as well, and published it on GitHub. Made changes to correspond to different structures between Citadel 101 and Citadel 1.3.5.1. There is no change in its usage. Here below is an example of using the tool to decrypt the configuration file which Citadel 101 receives from a C&C server. Since JPCERT/CC has only seen a small number of Citadel 101 cases so far, there has not yet been enough testing on the Citadel Decryptor. There may be some other changes that are not fully covered in this update. I would like to make improvements based on your feedbacks, including Citadel samples which cannot be decrypted with the Citadel Decryptor. Your pull request is also highly appreciated!